I agree that chicken pot pie is the ultimate comfort food!! I just wrote about how it’s my all-time favorite… Especially when it’s chilly outside. This version looks wonderful! That looks like the most perfect Chicken Pot Pie I have ever seen! That is one really nice looking chicken pot pie! I can easily go for turkey pot pie! Great way to use leftovers! I am excited to try this recipe 🙂 Have you ever used this crust recipe for a sweet pie(like apple, etc)? Yes, we love this pie crust for sweet pies too! I’ve never made a chicken pot pie from scratch before! This looks incredible! this looks like the perfect pot pie! this is one of my ultimate comfort foods! Turkey pot pie is on our menu for tomorrow, but I never found a recipe. Guess I just did! Cannot wait to try it! YUM!! I adore a good chicken pie. Will be making this one for sure!!! This looks so delicious. Look forward to trying it. Thank you. When do you include the Italian parsley? With the thyme! I updated the recipe. Sorry about that! Enjoy! Need the breakdown of carb, protein and fat. I am 9 months pregnant and was craving comfort food yesterday, the first snowy day of the year, so I made this recipe. It was fabulous. Wouldn’t change a thing. We ate half and froze the other half… husband already took a piece out of the freezer to eat again for dinner tonight! So delicious — I will be making this again. Thank you! Can I save calories and make it with just a top crust? It won’t cut into nice slices though, will it? Maybe have to use a spoon to serve the portions? What do you think will happen with just top crust? Hmmm, I have never made it without a crust. Maybe if you bake it in a pie plate and bake pie crust pieces separately and add those as “crackers” on top when serving? I did not mean without any crust – I meant just use a top crust – no bottom crust. I always use just one crust for my chicken pot pies. I use an oval casserole dish and just tuck in over the filling. Be sure to prick the top with a fork. It works great and just enough crust that you don’t miss the bottom one. I quarter it with two servings for dinner, and leave the rest for lunch the next day. Use a spoon to put in a shallow bowl. Not pretty but still delicious. was wondering about this and the quinoa enchilada bake- can they be frozen unbaked? Then I can thaw/bake when wanted? Yes, you will just need to bake for longer if they are still frozen. When you freeze is it before or after baking? If after, do you thaw and reheat? So, I know I’m weird – I love chicken pot pie – except for the chicken! I’m not vegetarian/vegan – I’m fine with chicken broth and cream – I just always eat the crust and veggies and leave the chicken. Is there a way to sub more veggies for the chicken? Like potatoes and broccoli instead? I’ve scoured the internet and can never find a good veggie pot pie that doesn’t also leave out chicken broth/cream of chicken soup//cream etc. thanks for any tips! You can sub with chicken of the woods mushroom. It really tastes like chicken!! 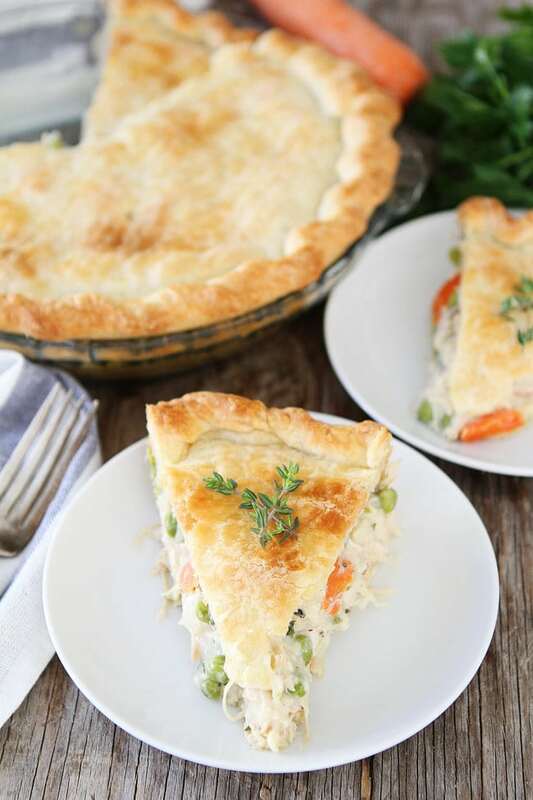 just linked here from your year end favorites, love this must have missed it, love that crust is NOT pre-made, thank you for this, perfect time of year for chicken pot pie! You can do either, but I like to freeze after it’s baked so I can reheat it easier. You can reheat in the oven at 350 or in the microwave. I like to freeze individual slices for lunches. Is there something I could sub for the heavy cream? (It’s the only thing I’d have to run to the store for..) I’ve read I could mix up a butter/milk combination but I wasn’t sure if that would effect the chemistry of how the pie sets. Oh I lied. I’m out of buttermilk as well. Is a makeshift sub for that a poor choice for the crust? How do you reheat after it’s been frozen? I pull it out in the morning and let it defrost and then reheat it. If you have single servings in the freezer you can defrost in the microwave and reheat. Delicious! My husband and I made this for dinner tonight but we used pheasant and I used a different crust recipe, only because I wanted to use ingredients I already had available to me. It was amazing. Cut and pie top were prefect. I made this pie tonight, just as the directions state and it was really, really good. I am very critical of most things that I made and I had nothing but good things to say. The crust is very rich and buttery and the sauce is delicious. Thanks for a great recipe! Yay! Thanks for leaving a comment. I am so glad you liked the recipe! Yummy!!! It is a different dish. I will definitely try it. Thanks for sharing this chicken pot pie. And I like your way of Directions. This looks so good! Do you recommend pre baking the bottom crust before filling? Can’t find the flipping recipe. Why are food blogs so annoying. People just want the recipe, fast easy done and gone.? Hi! I’m making this for dinner tonight! Just one question thoug…are the garlic cloves supposed to be minced? Or chopped? Or whole? This was a HUGE hit! We loved it! I mast have to make 2 next time. Everyone wanted more. Thank you! This is the best chicken pot pie I have ever made. I used split chicken breast – skin and bones included. Olive oil, salt and pepper and fresh sage (my garden) in a 375 oven for 35 minutes. Made a pate brisse crust (my usual) Then followed the recipe almost all the way. Forgot! I did not use a bottom crust. Hi, did you experience any burning when using only a top crust? I want to make this in individual oven-proof bowls, but with only top crust. Thanks, and Happy New Year! My husband said “totally awesome” Absolutely the best I ever had. The crust amasing. just made it…..filling is pretty good, it need it more flavor, for my taste and the dough is not very manageble, may be I did something wrong…..
My husband loves this recipe! It is a lot of work, but so worth it! It was his father’s day request. Has anyone ever tried making one and freezing it before cooking it? This is a fabulous pot pie. I am going to make it again and wonder how far in advance I could make the dough for the crust? You can keep the dough wrapped in plastic wrap in the fridge for 3-4 days. You can also freeze it for up to one month! Glad you liked the recipe! I’m freezing the whole pie.. how long and at what temp should I cook it when we’re ready to pull it out of the freezer? If you freeze the whole pie, how do you recommend warming it up again? Would you only recommend freezing a fully cooked pie? You can freeze it cooked or uncooked. If you want to freeze it uncooked, let the filling cool before adding the top and freezing. Wrap in plastic wrap and aluminum foil. When ready to bake, bake it frozen, no need to thaw, just add more time to the baking time, probably 15-20 minutes. This was so, so good! I made it for my husband and daughter and they loved it. Thank you for sharing this lovely recipe! When you freeze the pie and want to reheat what is your oven temp and for how long is it in the oven. Thank you in advance for the help. Can I make the crust the night before ? Yes, just keep the dough in the fridge. Have you ever put this together the night before and then baked it the next day? I am worried the crust would get soggy if you put it all together. Maybe make the crust and keep the filling separate and assemble the next day? Love this! Switched out celery and added potatoes! Great recipe! I would like to make this and have it on hand. Is it best to freeze it before or after you bake it? Thanks! I made a double batch of head chicken pot pies last night and they were incredible!!! The BEST pot pie I’ve ever had!! Even left over today…the crust was still flaky and crunchy. Made this today. Only thing I changed was I used frozen carrot and peas mix. We loved it. Great flavor and I make my own pie crust all the time — I decided to use yours today and it was wonderful! 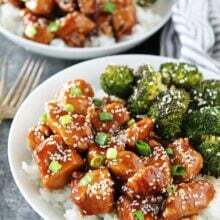 I made this recipe last night and it was so delicious! The only thing I added was some small cubed white potatos, and 1/4 cup of chicken broth, and cream (of each). The crust was also so nice and buttery with a very small hint of sweetness, I will definitely be keeping this recipe, Thanks! Glad you liked the pot pie! Very tasty recipe and easy to make. It really does look like the beautiful picture when you cut it. The filling stays put and the Pot Pie has a sweet comfort food flavor that will become a standard meal in my kitchen. Hi. I am just a bit confust with the dough instruction. Do I mix innthe cubed butter to the flour mixture or do i roll the butter into a sheet? Thanks so much and hoping for a quick response so I can bake this now☺️This seems like a very delicious recipe. Put the butter in the bowl with the flour mixture and then pour it onto the counter and roll the butter into the flour mixture. The butter will mix in. Enjoy! What if you wanted to make 4 ” or what the size is for smaller port pies? How long would you cook them then? You can make mini pies, fun! I would check at 25 minutes, just to be safe. It might take longer though. This looks great! If I want to make it ahead of time, is it okay to stay in the fridge until time to bake or should it be frozen? How far in advance do you need to make it? Made this last night. First time I have every made a chicken pot pie from scratch. It was totally delish last night and reheated in the microwave for lunch today. Was wondering how you thaw and reheat after freezing as I would love to try that as well. Made this tonight and it turned out amazing! The process for the crust was so easy and I’m so excited to use it again! It was an easy dinner to make, especially with rotisserie chicken! Note: Expect to spend some time making this. Total time as listed only works if you have everything prepared in advance. This looks & sounds amazing! I am planning to make this this weekend for a family camping trip. I plan to make it at home & then reheat it before we sit down to eat around the campfire. How would you suggest reheating without overlooking the crust? This was great. I added Penzey’s Mural of Flavor. This chicken pot pie recipe was amazing! My husband and kids loved it. I will definitely make again! Delicious! My kids were skeptical. Celery…eeeeww. They tried one bite and were in aww. Making this again today. Amazing recipe. I have one pot pie ricipe I have made for years, but this is much better! I made these today to freeze. I tripled the recipe and used aluminum 8″ pin pans. I had filling leftover so I put it in a loaf pan and topped with fillo dough I had in the freezer. Tastes great! Can you use puff pastry for the crust instead of using your crust recipe? Finally found the family chicken pot pie recipe for our family after several attempts! The filling of this pie was absolutely delicious – even the super picky 14 year old boys devoured the meal. Thank you for the wonderful recipe. I used a store bought pie crust due to a time constraint and it was still amazing. Next time I will try the crust recipes as well. Make it tonight – you won’t regret it! The pie crust is amazing! This was my first chicken pot pie…..it was great. Delicious! I would recommend making it without all the thyme and parsley as it does overpower the taste alittle. I tried adding less of each but it was still a lot. I am going to be making this again minus those two ingredients. The crust was so delicious and doesn’t need those spices at all. This was delicious! Everyone (kids included)!devoured it! This is my new go-to chicken pot pie recipe. Thank you! How do you reheat the frozen pies? My son- in- law, who before claimed not to like chicken/ turkey pot pie, tried to abscond with 1/2 this dish for his lunch today. It was the most delicious pot pie we have all ever eaten. I made this last night. I added diced potatoes that I boiled first. Ended up with a triple batch of filling and I made a generous double batch of sauce because I like the final pie a little bit drier. It was delicious! My husband and 23-yr-old son raved about it. 🙂 I ended up with 3 full size pies. I froze quite a bit in individual glass containers so it can be easily reheated. Great recipe. Thanks! Hello, I am very confused about the very first step. Can you add more depth or add it to the video? Because the recipe says to combine the butter with the flour mixture, then separate it to roll out the butter just to add it back to the flour in a ball? This just doesn’t make sense. Please help! Seriously the best pot pie ever!! This recipe was delicious! My husband loved it. Such a comfort dish for a chilly fall night. I did add mushrooms and leftover asparagus. So good! Will be making this again! I bet the mushrooms and asparagus were fantastic! Glad you liked it! This recipe is incredible! I made it last night and it is hands down the best Chicken Pot Pie ever! The crust was perfect and the filling had a wonderful flavor. My family loved it! I am so happy to have come across your site. Thank you! So easy and amazing! If you’re not using FRESH thyme and using the dry thyme, only use 1/4 tsp. Can’t beat this recipe! I made this last week. It is absolutely delicious! Did you use dried thyme? If so, you will need less. I use fresh. Is this a double crust pot pie? It looks awesome. This was the BEST chicken pot pie I have ever had. My family loved it. I sent a piece to my mother for dinner (she lives around the corner from me) and she said it was the best she’s ever eaten and she’s had it from several places famous for their pot pies. I cooked chicken breasts and cubed them instead of shredding. I used ready made pie crust and also added some cooked cubed potatoes. It added wonderful bulk and texture. Do not skip the thyme, that is what gives it such a great flavor profile. Will never use another recipe for chicken pot pie and am printing this one out for my daughter to go into a cookbook to give her when she gets older. Very good taste. I used pilsbury crust and it came out nice and flaky. I will make with turkey after Thanksgiving. Got compliments from my guests. I really loved this recipe. 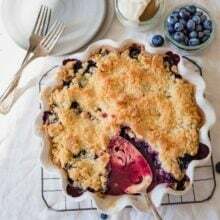 Only one thing, as for that delicious pie crust, I would lessen a little on the sugar like a teaspoon of sugar if it concerns a dinner pie such as this recipe. However, this would make the most perfect dessert pie crust imaginable! I love my mom r southern pot pie recipe HOWEVER YOU NAILED IT!! This was exactly perfect- I did not make my own crust (cheated ) BUT yours sounds awesome with the buttermilk. THANK YOU for appeasing this picky perfectionist I will keep trying your recipes!! Made this tonight. Came out solo much better than I thought. Made my own heavy cream an added diced potatoes. And made it in a bigger pan. So doubled the pie crusts an filling. Didn’t add salt either. This recipe is DELICIOUS! I used store bought crust to save time. Then, I cooked boneless/skinless chicken breast in a slow cooker (6 HRS on Low OR 3 HRS on High) until chicken shreds apart. My whole family loved it! That was supposed to be a FIVE STAR review, darn fingers on a cell phone… it is a delicious recipe! And also, for anyone who doesn’t have heavy cream, I have used milk with a bit of butter and it’s great too, so don’t let that stop you from trying it now! Glad you like the pot pie! Made it tonight for dinner. Would you recommend freezing this before baking? I made 2 of them, one for my in laws and one for us but thinking I may save it for a crazy busy week. You can freeze before baking or after. If you want to freeze before baking, it will take longer to cook after. If you freeze after baking, make sure it is completely cooled. You can reheat the whole pie in the oven or you can defrost and reheat individual portions in the microwave. I hope that helps! Hello, I made this recipe a couple weeks ago and loved it! Thank you! I’m wondering if anyone has tried using the crust recipe with other pies? I’m thinking of using it for my pumpkin pies on Thursday. I have made this recipe at least 5 times and am making it again today … it’s really quite easy and everyone LOVES it!!! Did not put parsley but I find the thyme really kicks up the flavor!!!! Made this today with leftover turkey, and added half of a potato (diced and parboiled before adding). Delicious! We’ll enjoy this all week as lunches, too. Easy to make and reminiscent of pot pies we enjoyed as kids. Thanks for sharing your recipe! Delicious! Used store bought crust but the filling was very easy to make and so yummy! I am determined to try making the crust recipe though. Great recipe, thank you! This pot pie was delicious! Ive never made one before trying this and i will do it again-soon! My husband atill talks about how perfect the crust is! Thank you! If you put the dough in the frig for a time and you take it out, wouldn’t it be hard to roll out cuz the dough would be cold n hard. This is the best recipe for pot pie I’ve ever used. I make it often. This sounds so good. I really want to make it. But I have a dairy intolerance. I can handle the butter but the heavy cream would do me in I am afraid. Do you think that I could substitute anything, like maybe coconut milk, for the heavy cream? This is an awesome recipe! Definitely the ultimate comfort food. I shared it with a friend and we both loved it! Would not change a thing. Thanks for this incredible dish. It’s just what I was looking for! Wow! Thank you so much for this recipe. I used my own crust recipe, but followed your instructions for everything else down to the crust protector, and it turned out perfectly! I loved that the filling was not a runny mess, but remained thick even after baking. The bottom crust did not turn into a doughy soggy mess, but remained intact. Your proportions/ratio of chicken/veggie to liquids were spot on. My husband ate 2 huge slices, and my son cleaned his plate, veggies and all! The simple/basic ingredients really enhance that comfort food taste! Wow. Thank you for sharing, this will definitely be added to the dinner rotations. On another topic, any recommendations on how to make apple pie filling that won’t turn the bottom crust into a soggy mess? EXCELLENT!!! Made exactly as the recipe called for. Crust was flaky, filling was perfectly seasoned. Love your recipes, vlogs and have used many for Christmas dinner. I want to make this delicious turkey pot pie-but do you think I can do it in individual oven-proof Bowl she and without a bottom crust? Thank you, and Happy New Year! 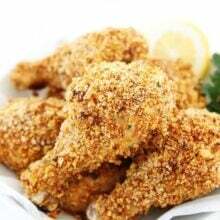 Hello, I have just did it and it was so much easy that another recipes I made in the past. Because it is not to elaborated and I feel the filling is more healthier. I made the crust the day after and leave in the refrigerator, so today I only have to the filling, at this moment it is in the oven, I can wait to taste it. I’ll let you know. This is by far the best EVER recipe for homemade Chicken Pot Pie. It is extremely easy to make and everyone will love it. I used the pre-made roll out dough instead of the homemade because i was in a rush. GIRL. You’re not kidding when you say “the best”!!! I don’t know you but I’m proud of you. This recipe is going in the book. I used a food processor for the dough (first time making crust and it came out great!) and added more veggies plus a parsnip :). Michelle, can you share a little bit about how you made the crust in the food processor? Thanks! Lovely recipe, thank you! I made it for my mom and little brother as they’ve just come down with colds. It was perfect. I placed the filling in a dish and placed store-bought puff pastry on top to bake and it was great! First time ever in my 20 year marriage I have ever made chicken pot pie for my husband and family, I’m so excited, I just got it in the oven. Can’t as I to see how it turns out. This my go-to for chicken pot pie! I don’t make the crust bc it’s easier to just buy it. But it’s DELISH! My kids love it. This is my number one pot pie to make. I just made this recipe. First time ever making chicken pot pie and it was a huge success! Wonderful flavor! The fresh parsley and thyme make this dish great! Thank you for a delicious recipe. I will be making it again tomorrow!! I just made this! It seemed to go pretty well! (it is in the oven as I type haha) I am just curious as to how you get the edge of your crust to look so pretty and fancy!! Oh it was so good did not have peas but everything else it will be done again! Recipe is a keeper. Made this several times. Always a favorite! Made this last night. It is fantastic! I did cheat and used store bought pie crust but other than that I followed the recipe exactly. Will definitely be making this again next time I have leftover turkey. This is by far the best chicken pot pie recipe I’ve ever made. I love the way it holds together to cut and serve and it does not run all over the place in your plate. Just PERFECT! Delicious! 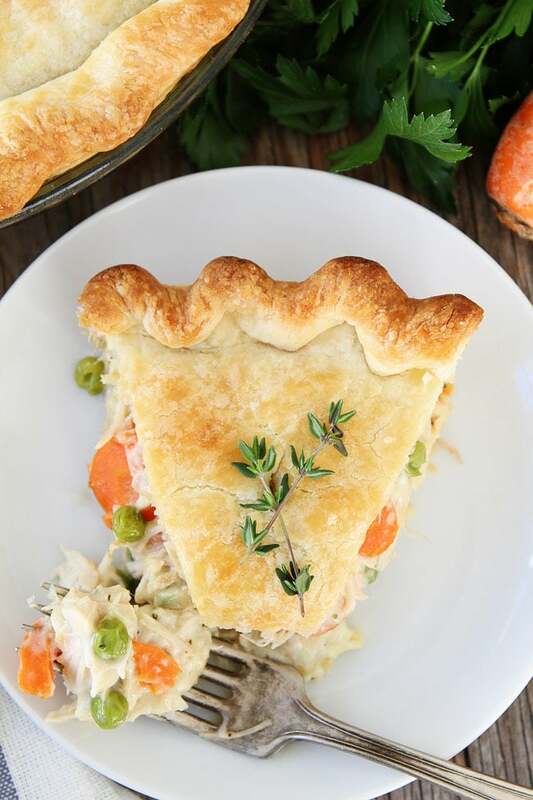 The whole family loves this chicken pot pie! 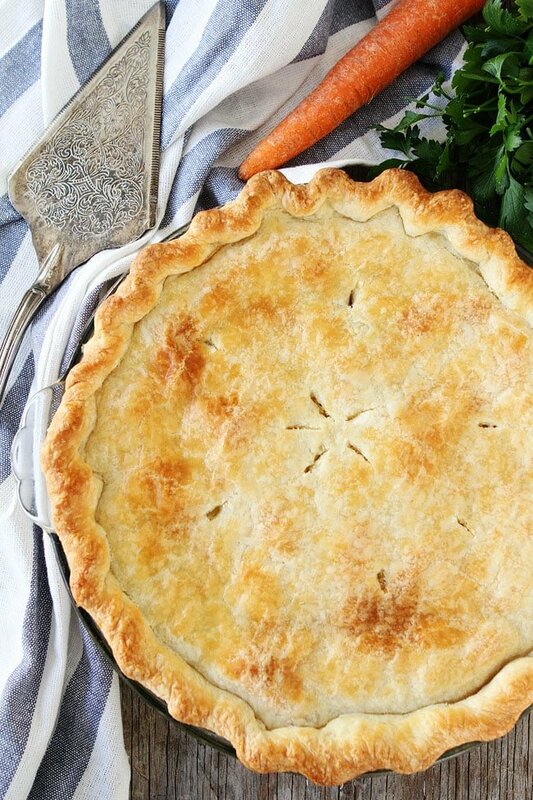 First off, this recipe is amazing and the addition of thyme to the pot pie is wonderful. I LOVE chicken pot pie and this recipe makes me so happy. This is also the best crust I have ever made. Thank you for the recipe! Wow, thanks for letting us know! Thanks for sharing! Very Good!!!! Will be making this again! Calls for way too much Thyme 🙁 ruined. This pie is delicious! Do you freeze it before it is baked? How long and at what temperature would you heat it if it has already been baked and frozen? 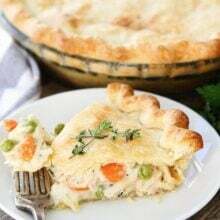 This is the best chicken pot pie recipe!!! It’s definit in my “go to” recipe file. Even my finicky son and grandson love it! The pie crust, filling and easy to follow instructions are all perfect. Thank you for sharing. I enjoy many of your recipes. One question though: I don’t have any chicken / turkey leftovers. Would it be ok to grill the chicken first, and then put it in the pie? Or, considering the baking time, would the chicken cook if put uncooked inside the filling? I am not sure though, maybe it’s best to grill it first. Cannot way to try it! How can you make this dairy free? Would a substitute milk work or add more flour to thicken? You can use almond milk. 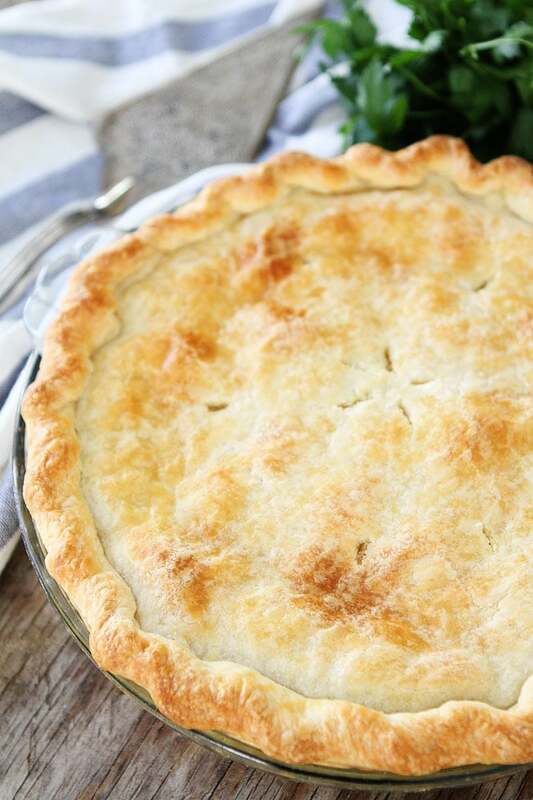 A really good pot pie recipe! Really easy. Very good. I use refrigerated pie dough and frozen vegetables. Double the recipe and freeze one. Made this today and my family loved it! I Used store bought pie crust, but I will try this recipe next time. I had enough filling for 2 pies. I made this tonight. Too bad I couldn’t post pictures, because I’ll say mine stacked up to what they have to offer. This is absolutely delicious, but make no mistake, there is work involved. The crust is very labor intensive, but is so impressive in presentation. I followed the recipe to a T, and the results are worthy of the labor involved. This dish is worthy of company, despite it’s humble origins. I’m soooo picky when it comes to recipes but this one is a winner (and I haven’t even made it yet. I love the crust ingredients, I’ve been looking for a new crust recipe. Can’t wait to make it! I want to make this and take it to a friend who is going through some difficult times. Do you think I could fully assemble the pie with a Pillsbury crust (including the egg wash on top) and take it to her to cook within a few hours of my delivering it, or do you think the crust would get soggy? I want to eliminate as much work as possible for her, so the closer to “out of the fridge and into the oven” I can make it for her, the better. Hello, I made this recipe for the first time today & my family and I were impressed with this delightful dish. The flavors were just perfect! We will be having this addictive dish again! Very easy to make. 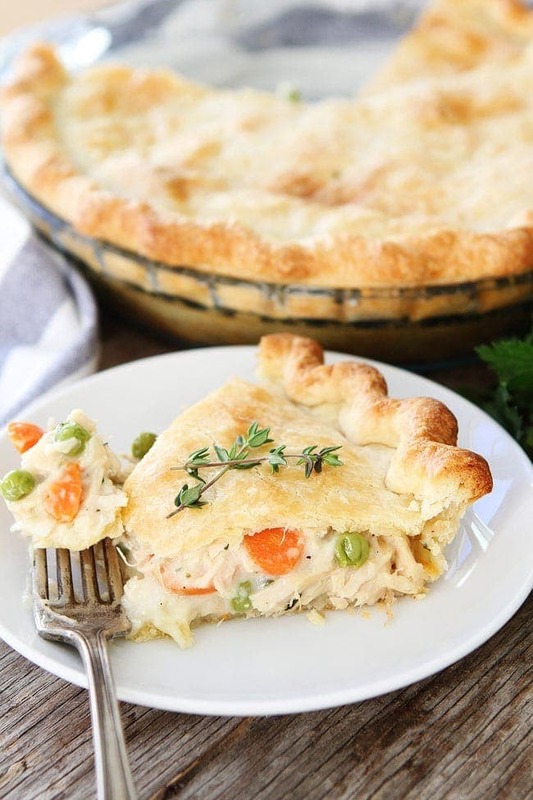 This chicken pot pie is perfect for the cold weather, Maria! It is truly a delight to munch on that crust and get to the creamy, buttery, and sumptuous filling. No wonder your kids LOVE this; my loved ones did, too! I cannot wait to try this recipe with turkey when I get the chance. Cheers! Delicious! Wonderful pie crust! My whole family loved it! This was delicious! No leftovers! This is the best chicken pot pie I’ve had. The crust was perfect. I hadn’t made one with buttermilk before but I certainly will again with meat pies. It holds up very well. YUM YUM YUM! I used a different recipe for the pie crust as I only had butter on hand. Other than that – followed to anT! I used light cream and rotisserie chicken. I can see this being a healthy recipe. Reduced sodium broth, Turkey, light team, less salt, less butter. But it was YUM! My boyfriend and his Mom loved it. I could’ve eaten that filling with a spoon as I cooked it. Haha. Had to stop myself. Turned out awesome. Forgot the peas but … oh well. Lol. It was delicious. Can’t wait to make this! Love all of your recipes 🙂 Can the pie crust be made a day ahead to save time for my hectic weeknight cooking? Thanks! We got this recipe from a friend and my family LOVES it!! In fact, after the first time making it they were wondering when if I would make it again the next night. It is now a weekly request!!! THANK YOU!! I used half and half instead of heavy cream. .. Also added basil because I love it! I made the chicken pie first and is heavenly! Decided to try the turkey now for a job event. I hope, I feel confident it will work, or looking forward to that. Very excited. This is about my third try in making a chicken pie from scratch and this one is a perfect winner, but I have to admit it takes some practice to understand the timing of everything. But,the saying is ‘Practice Makes Perfect’. This recipe came out AWESOME. Creamy, delicious, just the right amount of everything including ease. I added a bit more carrots than the recipe called for and also a pre-made crust. Everything else was followed to a T. May have added a bit more onion than recipe stated, but only because I couldn’t find the 1/3 measuring cup. By the way, this was my first time making a pot pie, or pie of any kind, on my own. Highly recommend for ease of directions, although again, I did use a pre-made crust. My husband is lactose intolerant. 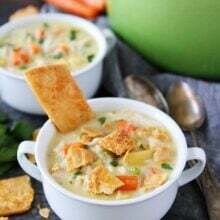 I have made creamy chicken and rice soup using whole coconut milk. Do you think I could use coconut milk instead of heavy whipping cream? Do you have the nutritional data for this recipe? I have to say that I was skeptical about adding the buttermilk. But it was more easy to handle than what other crust recipes that I’ve used. Perfect flaky texture as well. This is a keeper. Thank you so much for sharing! Great recipe on all counts. I’ve made a couple dozen different pot pie recipes over the years, but this was the one I was looking for. The recipe was clear and easy to follow, and the pot pie turned out perfectly: buttery, creamy, rich, and gorgeous (even with my lousy crust skills). I doubled the recipe and made it in a casserole dish with no changes to the recipe and had no trouble. Thank-you. Can you use bought pie crust for this recipe? I love this recipe. Great flavors. I used frozen mixed vegetables (corn, carrots, peas and green beans) and diced firmly boiled potatoes. This looks fantastic. I am a gluten free baker, and I’m going to give your filling a shot today with my own gluten free pie crust recipe. So looking forward to it! This recipe is amazing!!!! Thank you sooooo much!!! The pictures look scrumptious!! You mentioned freezing the pie. Baked or unbaked?? Delicious! I made this last night in a 8″ x 6″ casserole dish, with a butter crust on the bottom and top. I first baked the bottom crust in a 450 degree oven for 10 minutes before I filled with the mixture, then laid the unbaked crust on top, sealed and continued baking at 400 degrees for 40 minutes. This was sooo good!! I doubled the recipe and it was still all gone!! I would really like to see calories. Even approximate. De-li-cious. This crust is delicious. And the filling. I went with a bag of organic mixed vegetables that has peas, carrots, and beans and just tossed that in with the onion and garlic at the beginning. Also had no cream so I just poured a little milk. But it’s definitely on my recipe list now for future staples. Glad you loved the pot pie! This recipe was fabulous. Best pot pie recipe I’ve ever tasted. Thank you. This was so good!! How do you recommend storing in the freezer and how do you reheat? This pie and crust were simply delicious! I have failed at crust for years, but this recipe was simple, easy, and the crust turned out far better than I could have hoped! And the chicken pot pie filling is wonderfully comforting too. Can this be made low fat? Yum yum yum! This is on repeat at my house! I have made this recipe many times now and it never fails to WOW! Everyone I have ever cooked it for LOVES it. I haven’t been able to find a recipe that even comes close to this one. It is the Best! This recipe is so easy to make and absolutely delicious. It is my kids favorite meal. I use premade refrigerated pie crusts to save time on busy week nights. I Made this last weekend when it was cold and wet outside and it was the perfect Chicken Pot Pie. I followed the recipe and it turned out GREAT. Just made this for dinner last night. Absolutely wonderful! I’ve made my fair share of pie crusts before but followed your recipe and it was the flakiest most delicious crust I’ve ever made. Definitely a keeper. Thank you for an awesome recipe. We will be making this one many more times in the future. Very easy to make and assemble. I made my own crust that I’ve done for years. This one looks too convoluted. Oh my goodness this was exceptional! It was so warming and cozy on this cold night. To make things a little easier I used store bought crust and it was still amazing so I’m sure a homemade crust puts it over the top. For those short on time, I also bought mirepoix from Trader Joe’s so I didn’t have to chop the carrots, onions, and celery. This recipe will be on repeat! All I have to say is wow! This was the best pot pie I’ve ever had! Seriously. My dad smoked our Thanksgiving turkey this year, and I used that in lieu of chicken. I also used store bought pie crust (I know, I know). I didn’t have time to make it myself, which is my preferred method, but it still turned out amazing. If I’m buying a crust should I buy a pie crust or puff pastry sheet? I can’t wait to try this! I used store bought pie crust and it was perfect! This is by go-to recipe. Perfect for busy weeks! It’s so easy to use rotisserie chicken and it cooks so nicely in the pie. It couldn’t be better! Thank you!!! This is a great tasting pie. My family loved it. I love using fresh ingredients which is what drew me to the recipe initially. It took a little longer to make then expected (I made it after work for dinner). I would advise making it on a weekend and freezing it to eat later in the week unless you have time to make it earlier in the day. This recipe is a keeper!! I shared it with a few friends who also gave it rave reviews. This is so good. Like so, so good! We were eating th filling before we could even get it into the pie plate. I’m already calculating reasons to make it again, is anyone tired, sick or hungry…oh let me make you this delicious pot pie! Just made this for dinner !!! Sooo good ! !!! The crust is to die for ! It will be my go to crust from now on !!!! This looks absolutely delicious! If I were to bake it and then freeze it to use later, how do you recommend reheating it? At what temperature and for how long? Thank you so much! I have tried to make pie dough for decades (not a baker), but I am ecstatic to report that your dough recipe was finally a success for me! And the chicken pot pie is a new favorite. The resident chef and sous-chef (me) didn’t even tweak the recipe. Thank you! I’ve made this filling a couple times – it’s so good! I used store bought crust, and this time used extra chicken stock in lieu of heavy cream – still just as delicious! Best chicken pot pie recipe I’ve ever made! All the others are too soupy, too dry or call for canned soup. This recipe is just right. Absolutely incredible. Used a Pillsbury refrigerated pie crust and a rotisserie chicken. Perfect. Would you be able to make the dough for the crust in a bread machine? Delicious and easy! I added cubed potatoes to it and couldn’t find any fresh thyme at my grocery store so I had to leave it out but still great. Definitely making it again! Made this on a weeknight. I bought crust from the store, but followed the rest of the instructions to a tee. It still took me about an hour and a half. But it was worth it! It turned out delicious and beautiful! Wish I could attach a photo. I am sure it looked amazing:) Thanks for sharing! I’ve made this several times. It’s a hit with everyone. First time I made it, I followed the recipe. Now we are dairy free so I sup almond milk instead of heavy cream. It is still JUST as yummy. I also cheat and buy store bought crust though. Thanks for sharing. It’s a great recipe when making a meal for others also! I made this with roasted turkey breast and it was incredible! So thick, savory and a lovely flakey crust. My husband said it was RQ – Restaurant Quality! This is another keeper recipe. Thank you! By far my favorite filling recipe to follow! I have a crust recipe I use for everything. Curious, I’m making this for a vegetarian friend, how might I need to adjust the filling since since there won’t be chicken? You can use extra veggies, mushrooms would be a good addition! Amazing recipe. Highly recommend. Made exactly as written including the homemade pie crust. Yes, it took extra time, but the flavor cannot be replaced by a store bought crust. Husband and even my 5 and 7 year old boys ate it including the veggies inside! Thank you for sharing this piece of heaven. So happy you loved our chicken pot pie!